Get to grips with YouTube, Facebook, MailChimp and more. Getting your head around social media marketing can be a bit overwhelming, especially when you consider all the different platforms now available. The Social Media Marketing in 2019 Master Class bundle gives you the tools to successfully master social media marketing for just $29. That's 97% off the usual price of $1,000. Whether you're brand new to social media or have a little experience, these courses will help you create impressive marketing campaigns and make your brand stand out among millions of profiles. Learn the ins and outs of YouTube, Facebook and Google AdWords, and then dive into email marketing with a course designed to get you up to speed with MailChimp, WordPress and LeadPages. There's also training on how to master SEO, the secrets of influence online and Airbnb Experience Creation included. 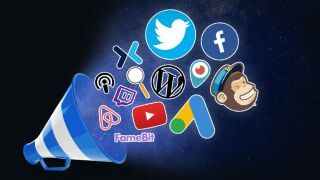 The Social Media Marketing in 2019 Master Class bundle is currently available for 97% off – get it for $29 here.